Fenerbahce Ulker hung on in a thriller to edge BC Khimki Moscow Region 85-82 on Thursday at Fenerbahce Ulker Sports Arena for tis first Top 16 victory. In a game that was close throughout, the fourth quarter featured a barrage of scoring. The hosts kept a slim lead thanks to excellent free throw shooting and took advantage of a key Khimki turnover to claim the win. 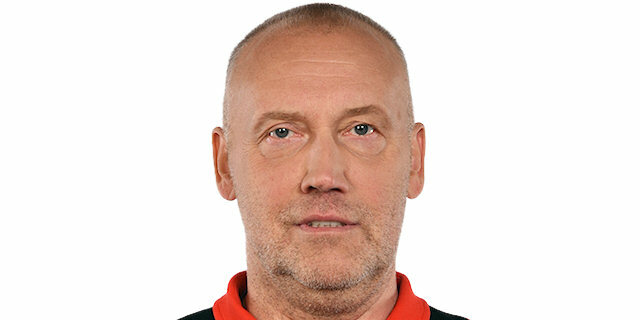 The key stat for the hosts, who entered the game ranked last in the league in rebounding, was that they outrebounded Khimki 40-32 – including 13 offensive rebounds. 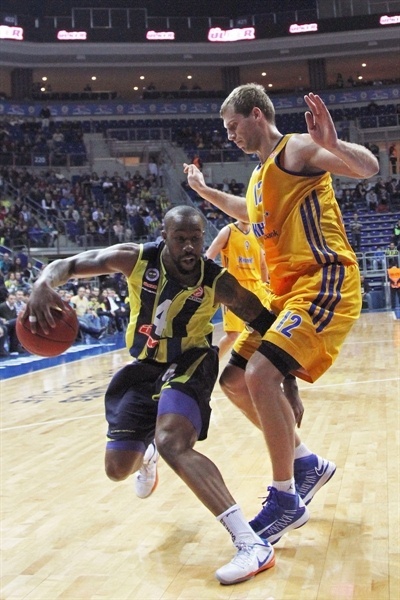 Bojan Bogdanovic paced the winners with 26 points, David Andersen added a season-high 18 and Bo McCalebb netted 16. Zoran Planinic starred for Khimki with 25 points, 6 assists, 4 steals and 13 fouls drawn. Paul Davis added 12 points, Vitaly Fridzon scored 11 and Kresimir Loncar 10 in defeat. Planinic fed Loncar inside on the opening possession for the game’s first points. McCalebb broke the ice for the hosts from the line. The Loncar/Planinic duo pushed the visitors to a 4-8 lead before Andersen, with a tough bucket in the paint, and Mike Batiste, with a steal and slam, tied the score. 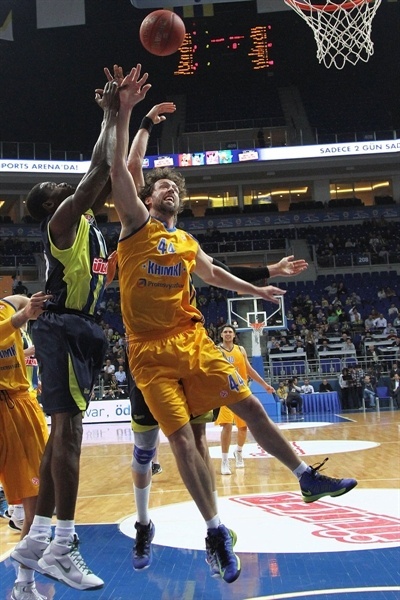 After a TV timeout, McCalebb blew through the Khimki defense for a layup and Fener’s first lead, 10-8. Fenerbahce got a bit wild after that and penetrations by K.C. 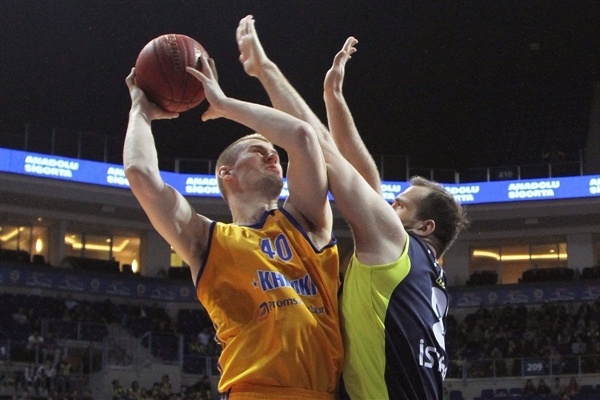 Rivers and Planinic boosted Khimki to a 4-point edge. Oguz Savas scored on the offensive glass to tie it, but Rivers finished a fast break with a layup to make it 14-16. After a timeout, McCalebb knocked down a pull-up jumper. Free throws by Davis and Kaya Peker left it at 17-19 after 10 minutes. Peker scored inside to even things and then Bogdanovic took over with a layup and then a wide-open three-pointer in the corner thanks to a steal and assist from Uros Tripkovic to spike his team’s lead to 24-19. 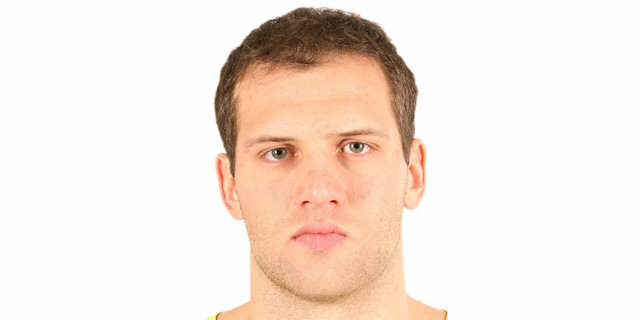 Planinic ended Fenerbahce’s mini-drought before Sergey Monya connected twice from behind the arc to tie the score and put Khimki ahead. Davis made a pretty pass to a cutting Fridzon to cap a 0-10 Khimki run. Even after Bogdanovic tipped in a missed Tripkovic three, Fridzon drained a three from the corner to put Khimki up 26-34. Sato stole an inbounds pass and found Ilkan Karaman for a slam before Bogdanovic closed the gap to 2 from the line. Frequent fouls slowed the pace of the game and brought the fans’ ire, but a triple from Andersen resulted in a rain of cheers. Planinic kept Khimki in control with 2 from the line to make it 36-40 at the break. Petteri Koponen converted a three-point play to give Khimki some breathing room, but Fenerbahce looked determined as Sato and McCalebb came through to make it 41-43. 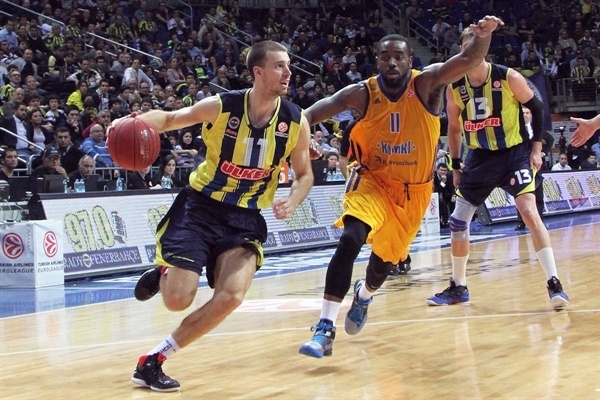 Rivers responded from downtown, but Fener was not about to quit. Andersen scored inside and Bogdanovic from behind the arc to keep the hosts within a basket, 46-48, midway through the quarter. Andersen completed the comeback and after the teams traded point over several possessions, Sato gave Fenerbahce its first lead of the half, 54-52, from the line. After Planinic tied it on a second-chance possession, but Bogdanovic reached 20 points for the game from the line as he gave the hosts a 56-54 lead through three quarters. 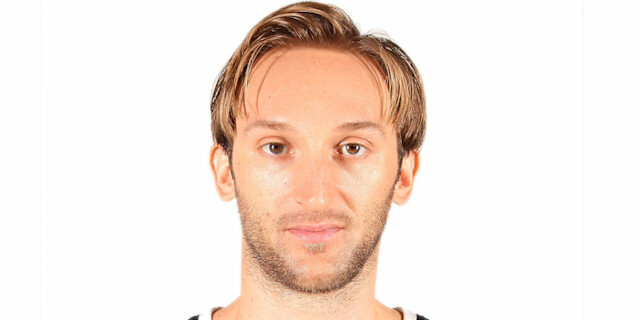 Bogdanovic scored first in the fourth quarter before Davis drew a fourth foul from the Fenerbahce scorer and kept pace for Khimki from the line. Davis then scored and was fouled, but missed a chance to put his team ahead from the line. Tripkovic netted his first basket before Planinic scored from the line to tie the game at 60-60. The hosts went inside, as Savas scored on the offensive glass and Andersen from the line to make it a two-score game. A Planinic triple drew Khimki within 66-65. The points came fast and furious as the game opened up. McCalebb exploded through the paint for a layup, but Koponen responded with a long jumper. Davis tied the score at 70-70 with just under four minutes to go. 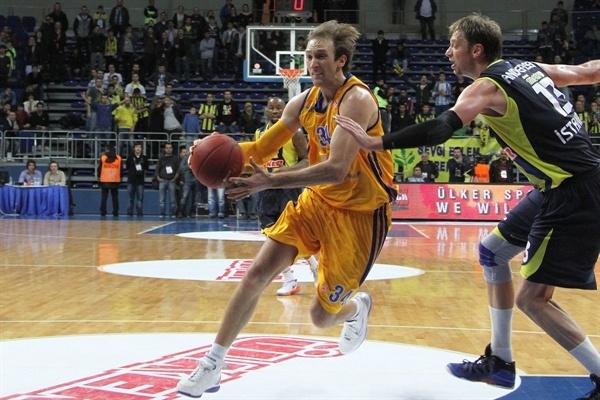 Bogdanovic battled his way to the line and restored a slim Fenerbahce advantage. Fridzon answered on the next possession. After a timeout, Bogdanovic fed a cutting Andersen for a basket-plus-foul. On defense the hosts forced Fridzon into a bad pass and then Kaya Peker’s offensive rebound and put back extended the lead to 5 with 1:42 to play. 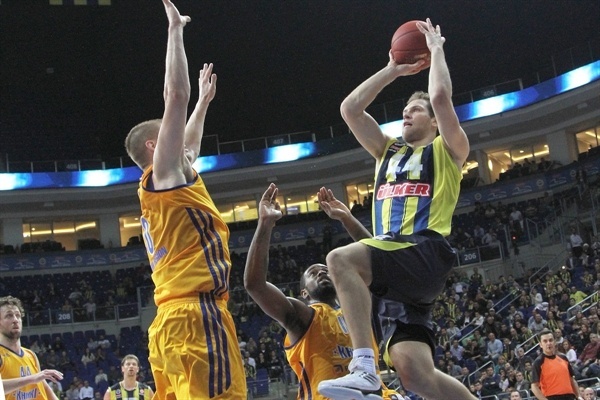 Planinic reached 20 points from the line as he kept Khimki within one shot. Davis rejected McCalebb at the other end, but Khimki failed to take advantage on offense. Instead Rivers fouled out in a scrum for a loose ball and with 56 seconds to go, McCalebb put his team up 78-74. Planinic continued his monster game with a 4-point possession – he split free throws and after Fridzon captured the offensive rebound, Planinic sank a triple with 26 seconds to go to make it 79-78. Bogdanovic sank free throws to keep his team ahead, but then fouled out as Koponen matched him as a free throw shootout began. 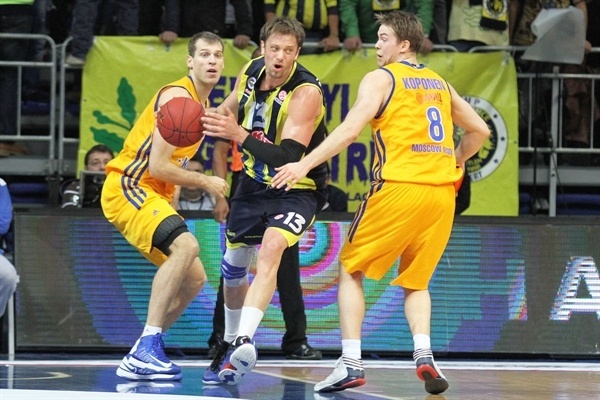 Ultimately Fenerbahce flinched first when Koponen passed out of bounds. With 12 seconds to go, Tripkovic added free throws to put the hosts up 5. When Planinic missed a triple, it was a signal to the fans that a victory was in hand. "This is a good victory for us. For my players, the most important things was to find their confidence one more time. We overcame difficult moments in the beginning of the season to get to the Top 16. After this incredible loss against Siena, we lost our confidence and my players became nervous. We needed a big win like this. It is a big win against a very good team. 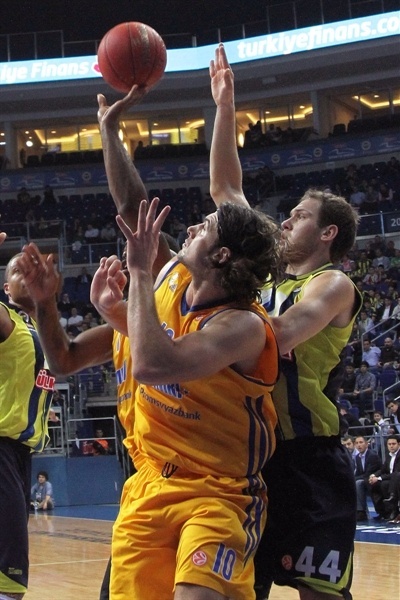 We were without Emir Preldzic and Omer Onan, who have produced a lot for us and are many minutes on the court. We found out yesterday night that Emir was not going to play and had to change our game plan. It was not simple, but my players had a big desire to win and fought. After the losses against Siena and Caja Laboral, many players were close to crying because they wanted something more. This is important for our confidence. It is not the time to see the Euroleague standings, but to fight for every possession like we did today." "It was not the end of the world for us to lose this game. 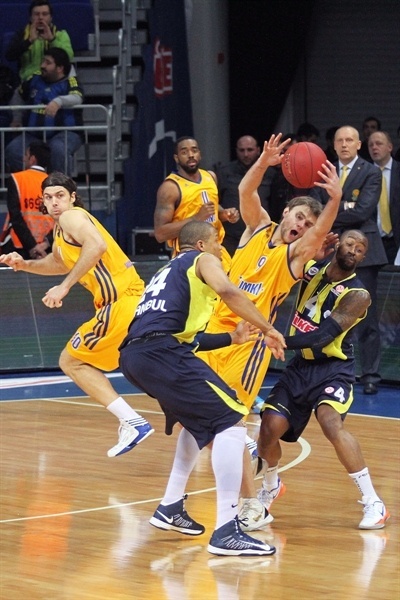 If we look at the game generally I can say that Fenerbahce Ulker did things better in defense. They were really good, especially in crunch time. They were motivated well because of their position in the group. It was a kind of do-or-die game for them. I have to give credit also to my players that they fought and did everything to win until the last second. The Top 16 is a place where top quality basketball is played. Everything can change in an instant. Anyway we still have a game to play against Fenerbahce Ulker at home." "It was a very important and well deserved win for us. We cannot handle another lose after having lost four games in a row. We were without very important players like Emir Preldzic and Omer Onan, but the main reason we won the game is that we fought and remained resistant for most of the game. We have to play this tough to have a chance to qualify to the quarterfinals." "Fenerbahce Ulker were well motivated tonight because of their situation in the group. They knew that things would be even worse if they lost. So it made for extra motivation for them to win the game. It was a head to head game, but they did some small details better than us in the last couple of minutes. Congratulations to them."